Thank you very much for choosing Forstron WordPress theme by WebMan Design! that are beyond the scope of the user manual, please join WebMan Design Support Center. Enjoy your Forstron theme! WordPress is a free content management system (CMS) that powers more than quarter of the internet. It can scale with your business when you're ready to grow and is easy to learn with many free and low-cost tutorials for beginners. No matter your level of knowledge, there is a WordPress tutorial to help you create, update, and fix your site. A WordPress theme changes the way your site looks and affects the style of the content displayed on it. WordPress themes are built so you can change your site's design without losing content. A WordPress plugin adds additional functionality to your site. There are many plugins available for free in the plugin directory, along with many premium ones out there to address nearly every site need, from eCommerce to email marketing to user registration. You can check the recommended plugins in the appropriate section of this documentation. You can run WordPress locally on your computer, or install and use it on your web hosting account (what kind of web hosting should you use?). Set the Authentication Unique Keys and Salts in wp-config.php file. Do not use admin as user name and set strong passwords! After installation is done, remove wp-admin/install.php file. Keep backups of the database and WordPress files. Keep your WordPress installation, plugins and themes up to date! You can further strengthen the security of your site by using a specialized plugins and services. (Re)download the theme package ZIP folder from the marketplace where you've purchased the theme from. 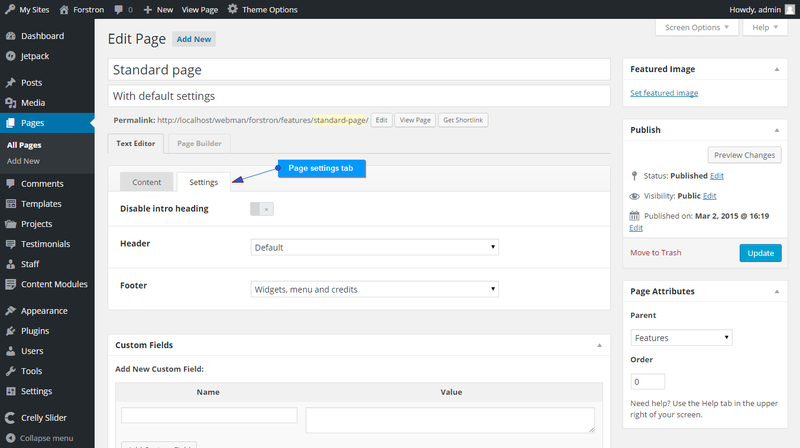 In WordPress admin navigate to Appearance » Themes and click the [Add New] button next to "Themes" page title. On "Add Themes" screen click the [Upload Theme] button next to page title. On the next screen choose the theme ZIP package file you've downloaded in step 1 above and click the [Install Now] button. After the theme is installed, activate it by clicking the "Activate" link. On "Add Themes" screen use a search field to search for "Forstron". Once you've found the theme in the search results list, click the [Install] button when hovering over the theme. After activating the theme, you can read the theme's welcome page navigating to Appearance » Welcome (you can disable this page in Appearance » Customize » Theme Options » Others). It is strongly recommended to follow or subscribe to WebMan on Facebook or Twitter to get the most recent theme update notices as fast as possible. You should always keep your WordPress, themes and plugins up to date! You will be notified in the WordPress admin bar each time a new updated theme version is released. To install this updated theme version please follow the steps below. If there is a specific procedure required for the theme update, this will be clearly stated on the WebMan's Facebook and Twitter pages. It is strongly recommended to back up your theme settings before you update the theme. This is only a precaution procedure and a good practice. For backing up the theme (customizer) settings, please use the Customizer Export/Import plugin. Have you obtained the theme from WordPress.org themes repository? The WordPress itself will notify you about a new theme update. The only thing you need to do now is to proceed with update procedure suggested in your WordPress dashboard. Have you obtained the theme from ThemeForest? 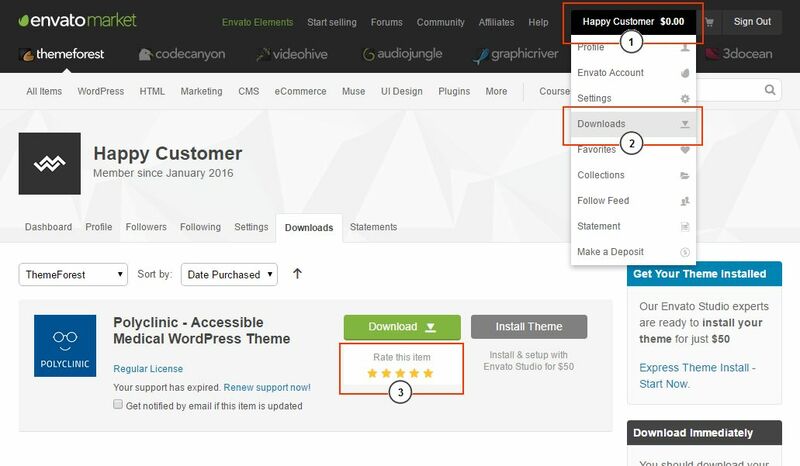 You can obtain automatic theme updates with help of Envato Market plugin. You can watch an instructional video on how to use the plugin, read about the plugin at Envato forum article or read a complete, illustrated instructions on how to use it. If none of these apply to you, you need to update the theme manually (see below). First you need to download the theme ZIP package from your marketplace. A simple way of doing a manual theme update would be deleting and reinstalling the theme directly via WordPress dashboard. You can read an article or watch a video on how to do this. (Re)download the theme package ZIP folder from the marketplace where you've purchased the theme from and unpack the theme installation ZIP file on your computer. Now you will need an FTP client to connect to your server. On your server navigate to YOUR_WORDPRESS_INSTALLATION_FOLDER/wp-content/themes/ folder. Delete the existing forstron folder (or create a backup just in case). Copy the unpacked theme forstron folder from your computer (from step 1. above) to the YOUR_WORDPRESS_INSTALLATION_FOLDER/wp-content/themes/ on your server. Log into your WordPress admin area and check the version of the theme in Appearance » Themes. Your theme should be updated now. Do you ask why do you need to use plugins when you expected the theme to have all the functionality in it? According to WordPress guidelines, the themes are meant for presentational purposes only, while plugins provide website functionality. The reason is simple. When you decide to update your website look in the future, you simply change the theme without loosing your website content and additional functionality such as shortcodes, e-shop or forum functionality among others. This theme follows this basic WordPress philosophy and you can sleep assured your website is as future-proof as possible! While you get beautiful look for your website with this theme, it also supports and integrates seamlessly with various plugins. For more info please read on. The theme uses the TGM Plugin Activation script that prompts you to install recommended plugins after you activate the theme. The suggested recommended plugins are essential to provide the core functionality the theme relies on and/or to ease out the process of editing your website pages. You can still use the theme without these plugins, however, its functionality and your user experience would be limited. Other plugins than the recommended ones should work with the theme with no issues, though some might require additional tweaks to integrate them 100% with the theme (this is usually the case of more robust plugins such as e-shop or directory plugins). Please understand that there are thousands of plugins available for WordPress and it is not possible for any theme developer to test the theme with all of them. Forstron was tested with most of the popular plugins. You can install any custom plugin following the WordPress instructions (or following the plugin documentation). In case of any plugin incompatibility or error, please, contact the plugin support first before contacting WebMan Design Support Center. Check out the list of other useful plugins too! This plugin extends the theme's functionality with additional content types, custom icon font, metaboxes and shortcodes (and page builder modules). It also provides seamless integration with Beaver Builder page builder plugin. This is essential plugin to provide advanced functionality for the theme and you will be prompted to install it after theme activation. If you need a page builder plugin to create your pages with ease with a front-end drag and drop editor, I highly recommend using the Beaver Builder plugin. The plugin is available both in free Lite version and payed Pro version. The theme is 100% compatible with this plugin. For more info on the plugin please visit the Beaver Builder website where you can also find the instructional videos for this page builder plugin. When you install a WebMan Amplifier plugin, it will enhance the free (and also the paid) version of Beaver Builder with custom theme page builder elements. You can then create the exact same website as the theme demo website with a free Beaver Builder only! Tutorials: If you are new to Beaver Builder page builder, you can watch instructional videos (check out alternative courses), or read the plugin's knowledge base. This plugin was built by Automattic (the company behind the WordPress) and contains a lot of very useful tools for your website. To choose some of the features included in this plugin: tiled galleries, image lightbox zooming effect, contact form, custom CSS, extra widgets, infinite scroll, better search, social networks sharing buttons, related posts display, CDN, site verification and others. For more info on the plugin usage and functionality please visit the Jetpack.me website. For creating unlimited number of widget areas (sidebars) and using them anywhere on the website. If you would like to control a single widget display instead of the whole widget area, you can use Jetpack plugin's "Widget Visibility" feature (or try Widget Options plugin). You can easily add posts and pages subtitles with this plugin. If you obtained the theme from ThemeForest, you can use this plugin for easy automatic theme updates. Display your business's contact details with seo-friendly Schema.org markup. A great form builder plugin for WordPress. Allows you to rename any post type. Perfect plugin for backing up your theme's customizer settings. Disables comments site-wide per post type. Completely free frontend drag & drop page builder. Edit your posts on the front-end of your site. Automatically resizes huge image uploads. Helps you control how WordPress generates thumbnails. Provides a drag & drop interface for managing pages and posts in the WordPress admin, while maintaining quick edit functionality. Lets you make a WordPress page (or other content type) link to a custom URL of your choosing. Making your WordPress website multilingual. A great free alternative to paid WPML plugin. Allows you to add a description to post type archive pages. Allows you to rename any taxonomy. Enables rich text editing in excerpts for any post type which supports them. Great free advanced, layered slider plugin. If you don't want to use Jeptack plugin's social sharing buttons, you may try using this great plugin. Checks your themes against the latest WordPress theme review standards. Add custom classes to your widgets. The theme integrates its predefined CSS classes directly into the plugin's interface automatically. You can just select the predefined class from the dropdown when editing a widget in Appearance » Widgets. As the theme uses CSS flexbox in its horizontal widgets areas you can control the width of the widget with `set-flex-grow-#` classes. A great plugin to keep your WordPress site secure. The best free image lightbox (zooming) plugin that just works! A great and easy to use drag & drop form builder for WordPress. It is recommended to install the theme demo content into an empty, fresh WordPress site only. Otherwise it might mess up your existing content! Please note that the theme demo contains a lot of pages. You will certainly end up not using most of them. In that case it is highly recommended to delete the pages, posts, custom posts and media that you no longer need on your website. It improves your website SEO, speed and relevance. Please understand that demo images, audio and video files are low quality due to copyright protection and you should replace them with your own, properly licensed images. Please note that there might occur some connection issues when downloading demo attachments (media files) from demo content servers during the demo content import process. These, however, are just demo attachments (images, videos, audio files) and you are perfectly fine (actually, you should) replacing them with your own assets. Other demo content (posts, pages and custom posts content) will be imported without any issues. For more info on automatic one-click demo content installation please read the Appearance » Welcome » "Installing the theme demo content". After installing and activating required One Click Demo Import plugin, head over to Appearance » Import Demo Data and run the import process. In case you experience an issue during the one-click demo content import, please read the online information article. For detailed instructions regarding each demo content file installation and download, please visit the theme demo files repository at Github. You can use this procedure in case the One-click Installation procedure fails. In that case it is recommended to delete (permanently) the imported media files from your media library and run the database reset with a plugin such as Advanced WordPress Reset. Please check WordPress codex for information about manual demo XML file import issues. In WordPress admin navigate to Settings » Reading. For "Front page displays" option set "A static page (select below)". Select the front page from dropdown list. This page will become your home page. Select the posts page from dropdown list. This page will become your blog page. TIP: You can also do this in Customizer where you get live preview of your settings. You can create all the pages using page builder plugin such as Beaver Builder. Each page displays an intro heading section above the page content, with page title and featured image (if set) as a background. You can disable this section in page settings tab. Just click the "Settings" tab above the page content editor (if you enable the Beaver Builder page builder, the page settings tab will be displayed in metabox below) and you will be able to set several different page options, such as disabling intro heading and setting up header and footer layout. Post excerpt will be displayed in posts list. If no excerpt set, a portion of post content will take its place in posts list (if set, until <!--more--> tag). Post excerpt will also be displayed at the top of the post content on single post page. Please note that you will probably have to enable post excerpt field in "Screen Options" first. If you set the "Read more" tag inside the post content and you also set a post excerpt, first the post excerpt followed with post content (until "Read More" tag) will be displayed in posts list. If you are setting up a multipage post (using a "Page break" button in visual editor, or <!–nextpage–> tag in "Text" tab of visual editor), the automatic table of contents will be generated for the post/page for you. All you need to do is to set up a post parts titles at the top of each post part (so, immediately after <!–nextpage–> tag) with H2 heading. These posts will display twice the size of the normal post on posts list pages (such as blog page or archive pages). To set up featured posts, please install and activate the NS Featured Posts plugin and easily mark selected posts as featured. Standard post What is it? This is basic standard blog post layout. Featured image, if set, is displayed as post intro title section background. Audio post What is it? Displays audio player to play your audio files. Could be used for Podcasting. To set the audio, use an [audio] (or [playlist]) shortcode in the content. The first [audio] ([playlist]) shortcode will be used in post media area above post content and will be removed from the original post content when displaying. If no [audio] or [playlist] shortcode used, but oembed media URL found, this media will be displayed instead of the featured image in posts lists. Gallery post What is it? Just add a [gallery] shortcode anywhere in the content. The first [gallery] shortcode images are used to create a slideshow in posts list display. Image post What is it? On single post page it acts like standard post, in posts list it displays an image followed by "Excerpt" field content or post title if no "Excerpt" field content set. Link post What is it? Enhances any links in the post content. No post title is displayed. Quote post What is it? Displays the post content as blockquote (any blockquotes in the content will be removed and replaced with single wrapping blockquote). Use <cite> to set the quote source, or set the quote_source custom field, or the post title will be used as quote source. No post title and featured image is displayed. Status post What is it? A short status update, similar to a Twitter status update. The whole post content is displayed without excerpt and post title. Video post What is it? Displays a video player to play your video files. Could be used for video blogging. To set the video, use a [video] (or [playlist]) shortcode in the content. The first [video] ([playlist]) shortcode will be used in post media area and will be removed from the original post content when displaying. If no [video] or [playlist] shortcode used, but oembed media URL found, this media will be displayed instead of the featured image in posts list. Also, the oembed media URL will be removed from the original post content when displaying. Supports also [wpvideo] shortcode when using Jetpack plugin. What Are They and How to Use Them? Projects custom post can be used to showcase your work. You can place any content into projects and create stunning complex layouts using Beaver Builder page builder plugin. Each project can be categorized and tagged and you can use these taxonomies for portfolio filtering in dedicated Beaver Builder "Posts (custom posts)" element. This custom post type is provided via WebMan Amplifier plugin. What Beaver Builder element to use to display Projects? Use "WM Posts (custom posts)" element and set the "Post type" option to "Projects". Before using Beaver Builder page builder with this custom post type you need to enable it in Beaver Builder's settings first. Navigate to Settings » Page Builder » Post Types. TIP: If you would like to rename this post type, use the Custom Post Type Editor plugin. To rename the custom taxonomies related to this post type, use the Rename Taxonomies plugin. With staff custom post you can easily manage your company's team info. This post type provides just short basic information about your team members, however, you can link it to any page/post or external website for more details on the person. For each person it is possible to set up a name, photo, department and job position and more info link. What Beaver Builder element to use to display Staff? Use "WM Posts (custom posts)" element and set the "Post type" option to "Staff". Testimonials posts can be used to display reviews you receive from your clients or customers. Besides the actual testimonial text you can also set its author details together with author photo or logo (featured image) and conveniently categorize testimonials for better organization. What Beaver Builder element to use to display Testimonials? Content Modules can be used as a content injection to various website areas. You can display it within any page or post content. Content Modules can be styled as icon boxes, so they are perfect for your services or benefits presentation. For each Content Module you can set up a title, description text, custom link URL, custom link action, featured image and/or font icon. If you use font icon, you can change the icon color and its background too. If you set both the icon and featured image, the special Content Module layout will be displayed: square featured image with overlayed icon on left and the module's content on right. It is also possible to conveniently group Content Modules using dedicated tags. NOTE: Content Modules are not meant to be used for inserting a basic content with a page builder. In Beaver Builder please use it's native "Text Editor" element instead. What Beaver Builder element to use to display Content Modules? Use "WM Content Module" element. TIP: You can modify the layout of this post type display with custom CSS classes. Shortcodes are basically commands you place into page/post/text widget content that will display content elements that are not possible (or would be too complicated) to create otherwise. WordPress offers couple of shortcodes natively and one of them is a [gallery] shortcode. You can read more on shortcodes in WordPress codex. For more information on available custom shortcodes please read the documentation of WebMan Amplifier plugin. With integrated Shortcode Generator it is very easy to insert a WebMan Amplifier's shortcode into the post or page content. Simply click the [S] button in page/post content editor, select a shortcode from dropdown and it will be inserted into the post content on the current cursor position. The theme is compatible with Beaver Builder page builder plugin that allows you to create a page/post content in drag and drop environment with ease, which is even more convenient way of creating a complex content than using shortcodes and Shortcode Generator. Forstron supports WordPress Menus, so you can easily create custom navigational menus directly in Appearance » Menus. Custom menus may contain links to pages, categories, custom links or other content types (use the [Screen Options] button in upper right corner of the screen to decide which content types to show on the menu edit screen). You can specify a different navigation label for a menu item as well as other attributes. The theme supports menu item description text. To display menus on your website you need to assign them to a menu locations or use them in conjunction with the Custom Menus widget. Please follow the instructions in WordPress codex on how to create menus. Helpful tutorial: WordPress video tutorials. For this functionality you will need to set the menu item CSS Classes attributes. To enable this attribute, check it in [Screen Options] tab in the upper right corner of the screen. With built in simple megamenu functionality you can display submenu items layed out into several columns. To create a megamenu from submenu items please set a megamenu columns-# classes on the 1st level menu item. The # in columns-# stands for a number of columns the megamenu should be splitted into: 2, 3 or 4. This 1st level menu item essentially becomes a wrapper and trigger for your megamenu. Then the 2nd level menu items (first children) becomes titles/headings of the megamenu columns. Finally, the 3rd level menu items (second children) within your megamenu are the actual column menu items. So, you should set these for each column (for each 2nd level menu item). The 4th level menu items won't be displayed in megamenu. Go to Appearance » Menus in the WordPress admin. Click create a new menu link. Give the menu a name, such as "Social Menu". Click the Links header on the left side of the page. Type a link (such as https://www.facebook.com/webmandesigneu) to one of your social profiles in the URL field. Give the link a title by typing the name of the service into the Link Text field. Repeat the above steps to add additional social profiles. In the Menu Settings section at the bottom, check the "Social Links" box for Theme locations. Adding your social links as a custom menu allows you to sort your profiles and add as many as you want. The theme currently supports following icons: Codepen, Digg, Dribbble, Dropbox, Facebook, Flickr, Foursquare, Github, Google Plus, Instagram, LinkedIn, Pinterest, Pocket, Polldaddy, Reddit, RSS, Skype, Spotify, StumbleUpon, Tumblr, Twitch, Twitter, Vimeo, WordPress, Youtube. For links starting with mailto: an envelope icon is applied. For unrecognized links a globe icon is used. Can I use a custom social icon? If you want to set a custom social icon, please read dedicated support article. If you want to add a social sharing buttons to your website to allow your visitors to share your content, please consider enabling the Sharing module of Jetpack plugin. Is displayed on all posts. If you want to display a sidebar on a page, please use a Beaver Builder page builder plugin. Displays widgets in footer area of the website. Widgets will be aligned into columns automatically depending on the number of widgets in the widget area. If you set more than 3 widgets (for website content width less than 1100px or 4 widgets for wider website content width) in this widget area, they will be spread into 3 columns, and masonry layout will apply. You can create a custom widget areas (sidebars) and use them anywhere on the website with a help of Content Aware Sidebars plugin. The theme seamlessly integrates its options into the WordPress Customizer. You can access it navigating to Appearance » Customize. All the changes you set in Customizer will be immediately displayed in the theme preview. However, these changes will not be saved until you press the [Save & Publish] button. You can set up your site's title, tagline and logo, header images, manage navigational menu locations and widget areas, set up a front and blog page, theme colors, layout, predefined texts and typography. All the custom theme options can be found under Appearance » Customize » Theme Options section. Why are my changes not being applied on the website? Try flushing your browser's cache first (repeatedly press CTRL + R keys or use instructions specific for your browser). If you are using a caching plugin and/or CDN, flush the cache. If you notice an error message in WordPress dashboard after leaving the theme customizer, please check whether you should set up the FTP credentials in your wp-config.php file. If none of the above helps, please contact WebMan Design Support Center. The theme is coded with best SEO practices in mind, meaning it is ready to be displayed on top of search results in search engines such as Google. Please note though, that this is just a basic SEO optimization and you will have to push it further to make the real deal with SEO. For such cases I recommend using Yoast SEO plugin. I recommend using Google Analytics by MonsterInsights plugin as it offers advanced customization of tracking of you website. You can also consider using Jetpack plugin's Stats module instead. To enable your language on your website, please switch WordPress into the desired language localization. Make a copy of the original forstron/languages/forstron.pot file. You need to rename the copied file now. The naming convention is based on your language code locale and renaming the file extension to "po". So, the British English file would be named as en_GB.po. Use Poedit to translate the file and export (save) translation also in "mo" translation file format. Upload translated en_GB.mo file into your WordPress language directory, such as /wp-content/languages/themes/forstron/en_GB.mo. Alternatively you can put translations into your child theme: /wp-content/themes/your-child-theme/languages/en_GB.mo. REMINDER: When you update the theme, all custom translation files will be deleted from /wp-content/themes/forstron/languages folder. Do not place custom translation files into that folder! If you would like translate the theme directly in your WordPress dashboard you need to use a specialized plugin for that. Please install and activate Loco Translate plugin. For instructions on how to use the plugin please refer to beginner's guide and/or technical overview. Don't forget to translate your plugins too! WordPress website is built from WordPress system itself, a theme and plugin(s). There is a very high probability that WordPress system is already translated into your language, so, you don't have to do it on your own. You have also learned how to translate the theme into your language above. But what about plugins and their texts? If you are lucky, your plugin contains your language localization files already and you don't have to do anything. But if you need to translate the plugin into your language, the best advice is to check the plugin's documentation for instructions (you can check the instructions for WebMan Amplifier plugin localization procedure). Alternatively you can also use Loco Translate plugin (again) to translate your plugins directly in your WordPress dashboard. If you have obtained the theme from WordPress.org themes repository, please translate the theme by clicking the Translate Forstron link in theme page sidebar. If you would like to help out translating the theme, please contribute on WebMan Design Support Center. Please note that we do not provide support for custom theme modifications! You are responsible for all the changes you apply to the theme on your website. If you don't feel comfortable enough coding, please, consider hiring someone who could help. When and How to Use a Child Theme? 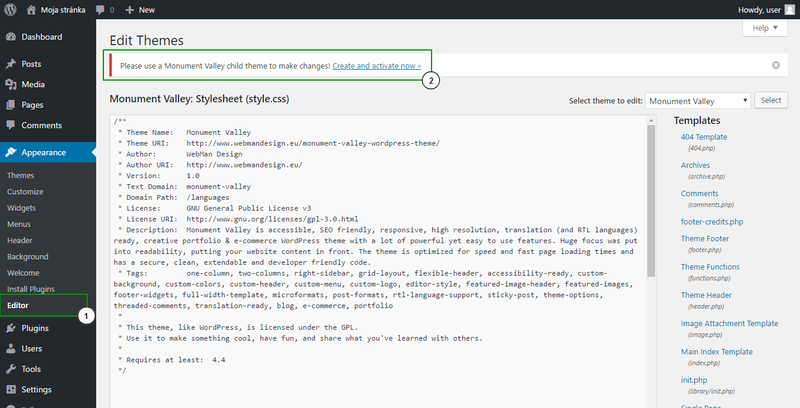 If you need to make any styling or functional changes to the theme, please use the WordPress native child theme functionality. This way you can continue updating the parent (original) Forstron theme without any worry of your changes being overwritten as all your custom styles and functionality are kept in a child theme. You can read more about child themes on WordPress Codex pages. If you also want to change the functionality of the original Forstron theme, do so in YOUR_CHILD_THEME/functions.php file. You can freely modify any theme function or class method there by hooking onto the specific "pre" filter or unhooking the function altogether (see below for how to use filter and action hooks). Forstron theme lets you create a child theme automatically. Just navigate to Appearance » Editor and click the "Create and activate now »" link in the displayed child theme notification. A new child theme will be created and activated for you automatically, so you can add any custom code in it. Please note that this option is not available when using WordPress multisite installation. In that case (or when automatic child theme creation doesn't work) please download a sample child theme (see "Additional resources" on left). How to use action and filter hooks? This topic is dedicated to WordPress developers who would like to modify the theme and alter or expand its functionality. Please note that we do not provide support for custom theme modifications, though. The theme is coded according to WordPress coding standards and is full of action and filter hooks. You can easily hook onto these to alter functions outputs or alter parameters and variables, to add your own meta data, theme or design options, layouts and much more! Please check the theme's source code for which hook to use(you can simply search for "do_action(" or "apply_filters(", respectively), or contact WebMan Design Support Center for more details and tips. Forstron theme also uses the Theme Hook Alliance hooks too. This is useful to entirely rebuild the theme structure or add your own sections anywhere in the theme. The whole theme front-end structure setup can be found in files inside the forstron/includes/frontend folder. You can also watch an instructional video on how to use WordPress hooks. To show all theme hooks you may try using Simply Show Hooks plugin or WP Inspect plugin. How to restyle elements with ease? Using special predefined CSS classes. How to set up custom icons set? How to set up cookies notification? How to customize error 404 page? How to customize WordPress admin? How to create tables easily? My images are blurry/small/of bad quality, what can I do? How to use the Formats button in post editor? How to edit the CSS or add your own? Yes, this theme predefines some useful CSS classes for you so you can use them in your page builder modules, shortcodes or directly in the HTML of your page or post. These custom special CSS classes will modify the appearance and even layout and behavior of your website elements. For full, up-to-date list of these classes and instructions on how to use them, please, refer to the "Custom CSS classes" page at the theme demo website. The utility icon set is used by the theme internally to provide icons for post meta information, for example. These icons can not be changed easily, you can override them with custom CSS code only. The theme uses Genericons icon set as the utility icons. Thanks to help of WebMan Amplifier plugin, you can use a set of custom content icons, which can be changed under Appearance » Icon Font in your WordPress dashboard using a Fontello online icon fonts generator. These icons are then available to set in Content Modules posts or for use anywhere on the website (just grab the icon-specific "Instant HTML" when hovering over an icon at Appearance » Icon Font page). By default, the theme provides its own custom content icons set best suited for the theme usage purpose. If you import your own Fontello icons set, this will override the default theme icons. In case you just want to add a new icons to the theme's predefined set, please import the theme's forstron/assets/fonts/fontello/config.json file into Fontello icons font generator first (as seen in the picture below) and then select your additional icons or import your custom icons SVG into Fontello (read instructions on how to use Fontello). Every European website has to conform European Union guidelines on privacy and data protection and inform users about cookies being set by the website. There are multiple ways to go about this with WordPress, you can use a plugin for that, or set a notification with Silktide Cookie Consent script (there is also a plugin for this script). In case you would like to customize the theme's error 404 page and you do not want to touch a line of code, you can do so easily with a help of a 404page plugin. For easier pages/post advanced settings use Advanced Custom Fields plugin. Once you activate this plugin, the theme will automatically create metaboxes for all the custom fields it uses for you. There are times you need to display tabular data in your posts and/or pages. This is not an easy task in WordPress if you are not familiar with HTML coding as there is no out-of-the-box tool to create HTML tables in post editor. But, there is an easy fix for the issue: try using a great TablePress plugin. For the information about what image sizes are declared in the theme and how you should set up the WordPress native image sizes, please navigate to Settings » Media and read the "Recommended image sizes" section. WordPress will rescale and crop the images to selected formats automatically during the image upload process. If you already have some images on your website, these need to be rescaled when using the theme. Please use a plugin such as Force Regenerate Thumbnails to do the rescaling for you. To prevent blurred images, please make sure you upload images of minimal recommended size (see "Recommended image sizes" section on Settings » Media WordPress admin page). It is recommended to use the Imsanity plugin to keep the sane size of the uploaded images on your server automatically. Set the plugin to your (boxed) website container width (you can tweak this in theme customizer) and lower the image quality to value of 70 (or to your preference). If you would like to use a lightbox effect (image zooming), try using great WP Featherlight plugin. To keep your images high DPI (Retina) screen ready, consider using WP Retina 2x plugin. To speed up your website loading time consider using a CDN on your images. You can try Jetpack's Photon or CloudFlare (or any other CDN). The theme adds a new Formats button to the visual editor of WordPress posts/pages. Please use this button to create a special elements, such as pullquotes, cite source, inline code, super/sub-scripts, uppercase text, hightlighted (marked) text. For all the formats please select a text in post/page content first. The format will be applied on this selected text then. Having a good host for your website is one of the most important steps you can make towards a speedy website. It should support PHP7 as that alone speeds up your website tremendously. Depending on your location it is also good to use a host that has servers in your country or on the same continent, at least. We recommend using Siteground, WP Engine or Pagely. You can also check out WordPress hosting recommendation page. You should always keep the file size of your images, video, audio and other asset files on your website as low as possible. We suggest preparing the images before you upload them to your website: compress them, reduce the dimensions (maybe even crop them). You can also use plugins to keep your image sizes down: Imsanity and WP Smush Image Optimizer, for example. In case of video and audio files set the optimal compression and formats before uploading them to your website. Maybe even consider using a 3rd party services such as Vimeo, YouTube and SoundCloud to host your video and audio files off your servers. Also consider using a CDN service such as CloudFlare. We recommend at least enabling the basic browser caching and GZIP compression of your website. However, you get better results using a dedicated caching solution such as WP Rocket (or try other WordPress caching plugin). Your hosting provider may actually provide you with a caching solution built directly into the hosting service. Check this with your hosting provider. For measuring your website performance and tips on how to improve it try using GTmetrix, Pingdom Tools and WebPageTest. If you need to apply a custom CSS to override theme styles, since WordPress 4.7 you can add your custom CSS into Appearance » Customize » Additional CSS. Alternatively use a child theme or custom CSS plugin (such as Jetpack's Custom CSS or Reaktiv CSS Builder or Theme Junkie Custom CSS). Once again, thank you for using Forstron WordPress theme. If you have any questions that are beyond the scope of this user manual, please join WebMan Design Support Center. I will do my best to assist you. If you like the theme, please rate it on the marketplace where you've purchased the theme from. Thank you!